Even after 30 hours of the blast at Fancy Bazar area in Guwahati that left four people injured, police have not been able to make any major breakthrough in this connection. DGP Kuladhar Saikia on Sunday reviewed the security situation with senior police officials at the office of City Police Commissioner here. An official privy to the meeting said that an alert has been sounded following the explosion, which comes two days ahead of the Durga Puja festivities. A strict vigil will be maintained at crowded places like railway stations, bus stops, malls, puja pandels and markets, said the official. But the police even after 30 hours could not confirmed if it was at all a bomb blast. A police official after the meeting said that the investigation of the blast is still on but police have yet to find out the details of the explosives used in the blast. 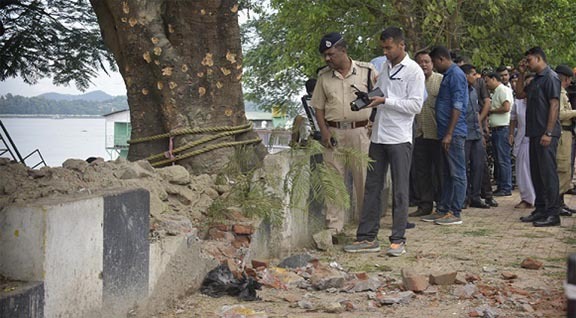 “Bomb squads of both Assam Police and Army have found traces of explosive materials from the debris but that is not enough to confirm a bomb blast. We have requisitioned the bomb experts of National Security Guards and a team is expected to arrive here from New Delhi tomorrow to ascertain the nature of the explosion,” TOI quoted a top police official as saying on Saturday. The explosion took place 12 am on Saturday behind a low pavement wall on the busy Mahatma Gandhi Road near Fancy Bazar on bank of Brahmaputra river . Minutes after incident, ULFA-I chief Paresh Baruah called up to local TV channels from an undisclosed location and claimed responsibility of the blast. “Our members carried out the explosion to protest the occupational Indian government’s attempt to settle Bengali immigrants in Assam through the Citizenship Bill. The attack is also against the conspiracy to derail the National Register of Citizens (NRC),” Baruah said. In the meeting, the security concerns over Durga Puja and the upcoming One Day International match between India and West Indies on October 21 at Barsapara were discussed, said the official.